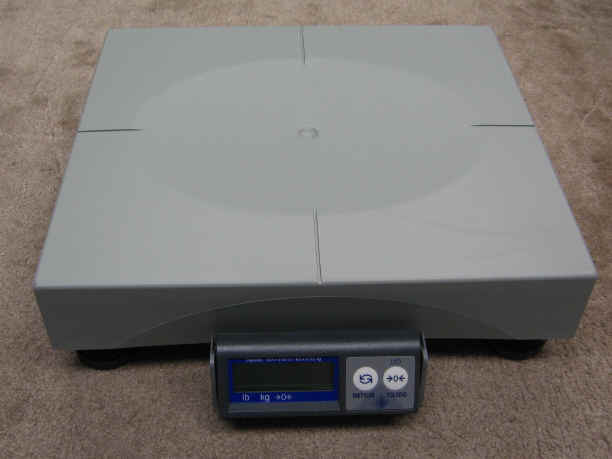 The PS60 is an affordable 150 pound capacity scale with a display and is specifically designed to be used with PC-based shipping systems like UPS Online Office shipping software, Tracer Clippership software, Aristo APSS, and virtually all other shipping systems. This NTEP Approved Scale comes with multiple protocol support for easy interface to shipping systems, Lb/Kg switchable. USB & RS232 serial output. Platter Size 12 1/4" x 11"
Interfaces RS-232, OPOS Compatible, Most POS System Protocols Included with Viva (MT8217, Avery Berkel, NCI/Weightronix, Fujitsu, Epelsa, CAS) – Order 8217 if IBM Port9B is needed. Electronic bench scale with large capacity and easy to read LED display. Lbs & Kg switchable. AC powered. RS232 output. Compatible with UPS Worldship software. Class legal for trade. 90 day warranty. Very good condition. The best value for a legal for trade scale. LPS150 / LPS400 scales are particularly suited to shipping/warehouse applications and general purpose weighing. 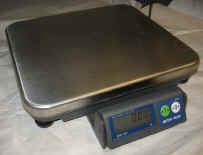 These are very affordable scales with accurate weights up to 400 pounds. The dual power modes (battery and AC adapter - both included) enable portability or permanent installation. The LPS Series features a full-duplex RS-232 interface. Fairbanks'® UltegraTM Series General Purpose Bench Scales are rugged and dependable. Replaces model 70-2453-4. These low profile scales can be used in a variety of applications up to 150 lbs No assembly required. It's ready to use right out of the box! 6 month warranty. Output is compatible with all UPS shipping software. RS232 output. Made of high impact ABS composite material, the Ultegra Series scales are both lightweight and extremely rugged. Replacing Model 70-2453-4, Up to 300% overload protection. Electronic bench scale with 150 lb or 400 lb capacity and easy to read LCD display. Lbs & Kg switchable. AC or battery powered. Bi-directional RS232 output. Heavy duty steel 12" x 12" platform. One year warranty. The PS60 is an affordable 150 pound capacity scale with a display and is specifically designed to be used with PC-based shipping systems like UPS Online Office shipping software, Tracer Clippership software, Aristo APSS, and virtually all other shipping systems. This NTEP Approved Scale comes with multiple protocol support for easy interface to shipping systems, Lb/Kg switchable. Includes 6 ft RS232 & USB cable. ABS platter. Fairbanks'® UltegraTM Series General Purpose Bench Scales are rugged and dependable. Replaces model 70-2453-4. These low profile scales can be used in a variety of applications up to 150 lbs No assembly required. It's ready to use right out of the box! 1 year warranty. Output is compatible with all UPS shipping software. Made of high impact ABS composite material, the Ultegra Series scales are both lightweight and extremely rugged. Replacing Model 70-2453-4, Up to 300% overload protection. For added flexibility, an RS232C interface cable is also included (9-pin connector). Easy to read LED display. Keys on front panel for LB/KG, TARE, ZERO, PRINT & NET/GROSS. 120VAC powered. Platform has a stainless steel cover with a stainless steel substructure. RS232 output. 2 year warranty. This scale is compatible with any software that works with a Toledo 8213, NCI 3825 or Fairbanks 70-2453-4. Shipping / Receiving, Manifest Systems, Parcel / Letters, Portion Control, Filling / Packing. Bright LED display. RS232 full duplex computer interface. Front panel keys are: lb/kg, Zero, Net/Gross, Tare, Print. 120 VAC, 50/60Hz adapter. Overall size: 13" x 13" x 4.4" high. NTEP approved. This scale is compatible with any software that works with a Toledo 8213, NCI 3825 or Fairbanks 70-2453-4. Shipping / Receiving, Manifest Systems, Portion Control. RS232 computer interface. Legal for Trade. Front panel keys: lb/kg, Zero, Net/Gross, Tare, Print. LED display. 120VAC adapter. Overall size: 13.2" x 10.2" x 3.8" high for SP, 18" x 18" x 4.8" high for SRP. Optional Indicator Tower . NTEP approved. This scale is compatible with any software that works with the Toledo 8213, NCI 3825 or Fairbanks 70-2453-4. RS232 computer interface. Legal for Trade. Front panel keys: lb/kg, Zero, Net/Gross, Tare, Print. LED display. 120VAC adapter. 18" x 18" x 4.8" high. Optional Indicator Tower . NTEP approved. Easy to Read: Six digit LCD external display with large 12" characters, tactile keys, 7 ft. cable and Velcro for mounting. Accurate and Reliable: Precision Load Cell and Quality Electronics ensures repeatable weight measurements and trouble-free operation. Point-of-sale interface scale for linking to electronic cash registers or POS terminals.NCI Model 6720 is designed for use in grocery and health food stores, cafeterias, convenience stores, candy shops, hardware stores, pet stores or other retail locations.